Personalized Microsites Push Websites Beyond "Find a location near me"
Your website flies high as a top marketing channel and performs many functions. Your website provides product and sales information, store location and hours, prompts visitors to share via social media, and appeals for their e-mail address. But how can you personalize your customer’s shopping experience while still presenting a fixed message on a corporate website? How can you improve SEO and increase customer traffic in your webroom, and attract online shoppers to your showroom? Simple landing pages are one option. Transactional landing pages go one step farther. But neither of these pages localizes, and therefore personalizes, the visitor’s experience by highlighting your company’s human capital: your in-store experts. It is your customer-facing staff, these in-store experts, who will interact with your customers and can push a prospect to visit a store, make a purchase or increase the size of a sale. 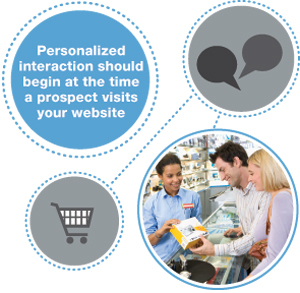 The time to begin that interaction should not be when the prospective customer hopefully walks into your showroom. That personalized conversation should begin at the time that prospect visits your website, when a human face can be placed with your brand. Climb Technology’s microsite tools can easily and quickly be integrated into your online architecture for full transparency and increased SEO. Once the prospective customer is at your microsite, your employee-experts further engage customers through contact links, bios, and other personal and professional information. All of these features are easy to integrate and affordable with the Stores4Stores software suite. With the vast majority of sales beginning with an online search, it is critical to personalize the experience for your prospective customer, and bring that interaction from cruising altitude to the store on the street in their town.